Can all products be Embroidered or Printed? You can customise all garments on our site but there are occasionally limitations due to the type of fabric in the garment. 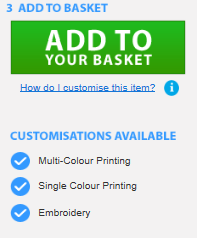 You can check if the product is suitable for print or embroidery by clicking on the product page. Look out for below information.